Economy Roll Up Banner Stand-33" Width - Dino Rentos Studios, INC. This Economy Roll Up Stand is a great addition for tradeshow displays, expositions, and promotional events. This banner stand is perfect for budget-conscious businesses. This pull-up display is easy to operate, and requires no tools or adhesives to set up. 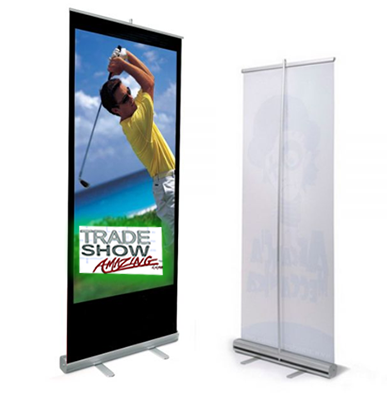 Each banner stand features a retractable design that protects your graphics during transportation. The base houses the vinyl graphics and keeps them protected when not in use.